The Minsk Agreements were signed on Sept. 5, 2014, at the peak of the armed conflict between Ukraine and the unrecognized rebel republics in its Donbass region, calling on the sides to stop the clashes. But how did the attempts to regulate the Donbass crisis evolve after that? We look back at two years of diplomatic wrangling that has failed to achieve real progress in resolving the conflict. After the 2014 uprising in Ukraine, when President Viktor Yanukovich fled the country after a popular uprising led by the Maidan movement, the country's east was thrown into turmoil. Residents of eastern Ukraine, which is historically close to Russia, were afraid of the growth of nationalism in the country and rumors that the Russian language would be banned. After Russia's annexation of Crimea, pro-Russian activists in the Donetsk and Lugansk regions began an armed rebellion, taking control of a series of cities. As a result, in the summer of 2014 a full-scale war broke out in southeast Ukraine between the Ukrainian armed forces and the militias of the self-proclaimed "people's republics" of Donetsk and Lugansk (DNR and LNR). 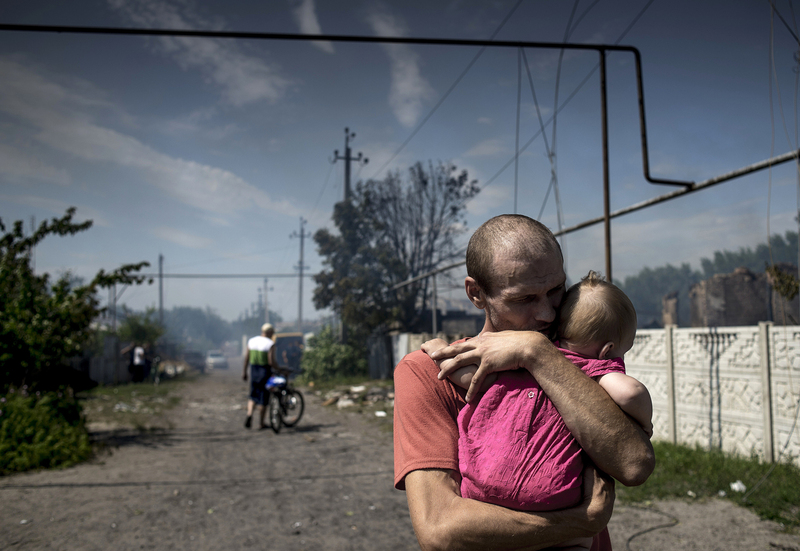 The war was merciless, with shelling from both sides leading to the deaths of innocent civilians and the destruction of infrastructure in the once wealthy Donbass, the center of Ukraine's coal and ferrous and nonferrous metallurgy industries. As the summer wore on, government troops gained the upper hand as the rebels were forced to retreat again and again. However, just when it appeared the rebel republics would collapse, the situation changed completely: The militants inflicted a series of heavy defeats on the Ukrainian army and routed government forces from a number of key cities. This bizarre reverse, coupled with the acquisition by the rebels of a substantial amount of heavy weaponry, including tanks, led many observers to conclude that the breakaway republics were receiving logistical and material support from Russia. As DNR and LNR formations continued to advance in August 2014, Ukraine decided to regulate the situation diplomatically. On Sept. 5, 2014, representatives of Russia, Ukraine, and the DNR and LNR, along with OSCE observers, signed the Minsk Protocol (“Minsk-1”) in the Belarusian capital. The document obligated the sides to a ceasefire and the exchange of prisoners. Under the terms of the document, Ukraine promised to decentralize power, passing a law "on special status" for the rebel-controlled Donetsk and Lugansk regions. Minsk-1 did not bring peace to the Donbass. Throughout the fall of 2014 neither side stopped firing completely. There were countless skirmishes and the shelling of inhabited settlements continued. Nevertheless, the intensity of the conflict in this period subsided. Humanitarian supplies were brought to the DNR and LNR territories, including from Russia. In January 2015 full combat activity was renewed. Vladimir Yevseyev, deputy director of the Institute of CIS Countries, notes that high expectations played a big role: According to him, after a relative truce the Ukrainian military, having accumulated enough power, decided that it was capable of winning back the Donbass. Meanwhile the rebels thought they could expand their territory. "In the end, after more clashes and hundreds of victims, both sides realized that they did not have enough power to achieve their objectives," explains Yevseyev. After the failure of the Ukrainian military's advance and the encirclement of Ukrainian units near the vital rail intersection of Debaltseve, Ukraine again turned to diplomacy. The Minsk-2 Agreements, signed by Russia, Ukraine, the DNR and LNR on Feb. 12, 2015 once again provided for an immediate ceasefire and the withdrawal of heavy weaponry, which would pave the way for political regulation. Ukraine was expected to carry out constitutional reforms that would strengthen the special status of Donetsk and Lugansk. Afterwards the republics were to hold elections and Ukraine would establish control over its border with Russia. The key difference between Minsk-2 and Minsk-1, according to Russian experts, was a higher degree of representation. The new agreement was discussed by the leaders of Russia, Ukraine, France, and Germany. The European countries and Russia acted as guarantors of the implementation of the agreements, on the part of Ukraine and the DNR/LNR respectively. However, the peace faltered once more after Minsk-2. Elections in the DNR and LNR, which were initially scheduled for fall 2015, have still not taken place. Ukrainian representatives state that society is still not ready for them. "Ukraine does not have the political will to negotiate with Donetsk and Lugansk," says Yevgeny Minchenko, director of the International Institute of Political Expertise, a Moscow-based research NGO. Concerning combat activities, in Minchenko's view, Minsk-2 led to a strange situation – "neither peace, nor war" – in which there were no large-scale military operations and when periods of truce alternated with escalations. Vladimir Yevseyev agrees, adding that at the end of August 2016 the ceasefire was being violated an average of 300-350 times daily. According to a Novaya Gazeta newspaper summer report from the military demarcation line, both sides occasionally violate the truce and losses continue to increase in both camps. Experts believe that the situation may once again deteriorate and turn into a full-blown war. Nevertheless, the main negotiating parties and the contact group regulating the situation in eastern Ukraine (which includes Russia, Ukraine, the DNR and LNR) continue to make efforts to solve the crisis in Donbass, though the negotiations show little sign of real progress. The latest ceasefire took effect on Sept. 1, 2016 after the contact group made an agreement in Minsk. For now it is unclear how durable it will be. Russian observers say that it will be impossible to regulate the Donbass conflict without the participation of the U.S., Ukraine's key partner. "Today only the Americans possess the most important levers of influence," says Yevgeny Minchenko. Vladimir Yevseyev stresses that U.S. President Barack Obama's departing administration is concentrating on Syria and is unlikely to take an active position on Ukraine. Thus, most likely the fate of the Minsk process will largely depend on the policy of the next U.S. president.